Apologies for the brief disappearance from the blogosphere. Michael has been recovering from an injury which he will report on soon. Luckily he’s been managing it well with physical therapy and is making a comeback to the trails this morning. 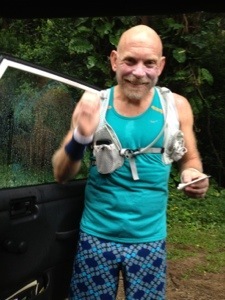 He’s just started a 22 mile out and back from the Pali lookout to Waimanalo. It’s rainy in the hills this morning so we’re praying to the solid footing gods for no slips or spills. Woo hoo!!!! Good to see you back out there!!! Great to hear that you will likely join us in Arizona!